Another thank you to David M. aka petrichor@Flickr (and Kipili.com) for sharing an image via the BPotD Flickr Group Pool (original). Appreciated once again, David. 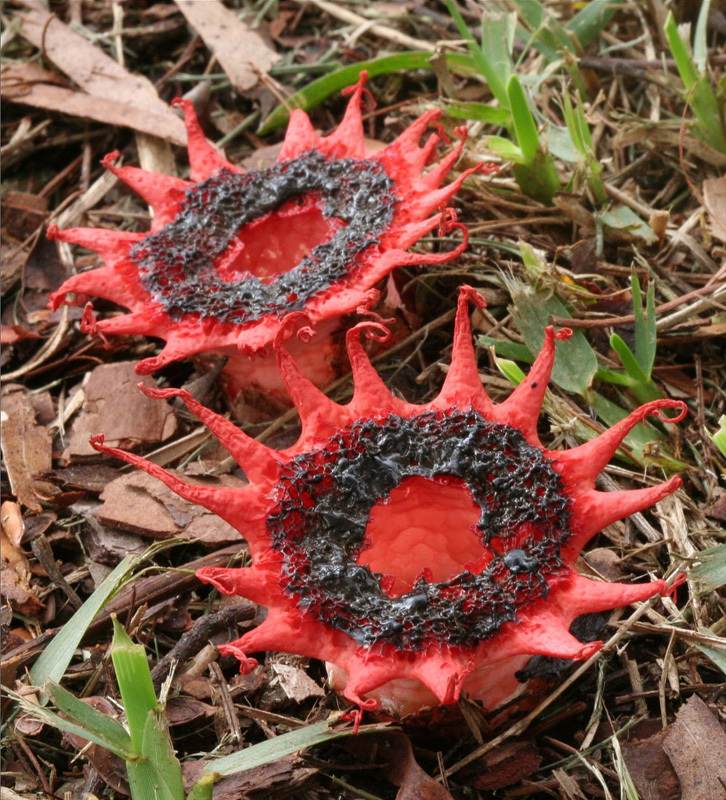 Starfish fungus or sea anemone fungus has previously been featured on BPotD here: Aseroe rubra. Today’s photograph illustrates the fungus a bit later in development – considering how quickly stinkhorns develop and fade, I suspect these individuals are only a day further along than the starfish fungus in the previous entry. Whoa! Day of the Triffids, or what? I know fungi can be weird but this is really WEIRD! Thanks for the info – this is just great! Science fiction has nothing on Aseroe rubra, on the contrary, I see a sequel to the Little Shop of Horrors. holy smackaroo….these are something else…does anyone have a receipe i could put these with…just kidding….you know they would taste awful…!…i think….daniel…a question…do plants have brains..?…i don’t mean as in humans…when a tree goes dormant and the wood freezes in winter…the life force moves to the roots…are the roots like a brain…?…just wondering…. Wow, these are beautiful, Daniel. Thanks for informing us of this species. Flora is so interesting and bazaar, at the same time. What a wondrous world we live in!!!! Thanks for bringing this world to us in pictures!!!! Amazing! One could easily believe they are the fantasy products of someones imagination, made of plastic, more amazing to know that they sprouted from within the earth. ‘Disgusting red’ sums it up nicely, but still there is a weird beauty in the design and texture, definately the sort of thing that would be growing in The Wicked Witch’s garden! Travaillant actuellement sur le genre Aseroë, j’aimerais savoir exactement où cette magnifique récolte à était effectuée s’il vous plait. The mention of Triffids above was appropriate; a mention of the movie “Alien” could also be included. Nice pic. I have these horrid things in my garden. They really stink and the flies love them. Got some good pics of mine today. YUK! Forgot to mention, I am in Australia. I just realised this site is in Canada? Sorry!